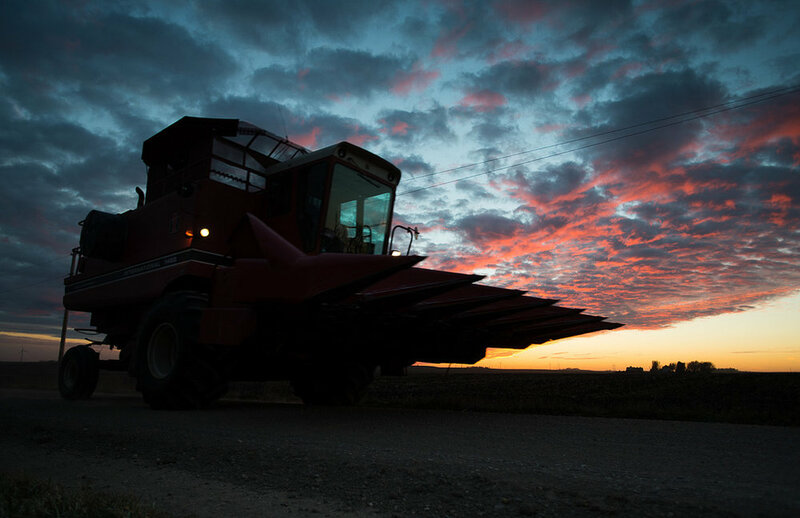 A combine travels down a county road in Carroll county under the backdrop of a magnificent sunset. This year’s harvest is in its twilight. When finished, Iowa farmers will have harvested nearly 415 million bushels of soybeans and 2.2 billion bushels of corn despite a growing season that included spring floods and a fall drought. Many attribute the tremendous bounty to better farming methods and advances in biology that make crops more resilient. As a photographer, I should be taking more sunrise and sunset photos. I’ll be the first to admit it. With that being said, there are always excuses that come along with what I know I should be doing. From helping parent two kids and busy schedules (especially now that school has started), time is at a premium. It makes it hard to justify a drive through the countryside at 5 a.m. or 9 p.m. But it seems that every time I’m motivated to chase those photos, the reward far outweighs the work. I always feel that I come away from a sunrise or sunset outing with some great photos, but there’s an even greater satisfaction. For me, it gives me time to slow down and notice some of the small things that a busy lifestyle can easily miss. A vine that has attached itself to an old wooden fence, mist rising from one of Iowa’s many wetlands or the shadows that define rows of soybean fields. There’s nothing like driving down a gravel road with your windows down while the golden hues of the sun make an entry to or departure from the day. I hope you can take a moment to slow down and enjoy the following photos I captured yesterday while chasing a sunrise through my favorite playground… along some dusty roads in Iowa. During the next two days, Iowa will see some of the coldest temperatures it has faced in nearly two years with highs in central Iowa only climbing into the teens and lows reaching near zero. North Iowa has been dealing with temperatures that are 5 to 10-below with wind chills of 25 to 35 below. Farmers are reminded to make sure that cattle have access to water and have shelter from the wind.